Podcast: Episode 3 - What Should Lawyers Post on Social Media to Get More Business? Podcast: Episode 3 – What Should Lawyers Post on Social Media to Get More Business? Not sure what content you’ll need for social media? On today’s episode of Social Skills, you’ll learn how you can use photos, videos, and blogs to educate and engage your target audience, and since every law firm is different, you’ll learn how to craft the content strategy that is tailored to your law firm and the types of clients you want to attract. So what are we waiting for? Let’s get started. Welcome to the Social Skills podcast. I am your host, Ethan Wall, social media attorney, digital marketer for lawyers, and author of our newest book Social Skills: How to Attract More Clients for Your Law Firm through Social Media Marketing, and I am here with my tag team partner Chido. Hey everybody. I’m Chido. I am the Social Media Manager here at Social Media Law and Order. Welcome back to the Social Skills podcast. Today we will be talking about what should lawyers post on social media. So let me guess. You’re sharing content on social media, but no one’s liking it. Why? There may be a few reasons. Maybe you posted your content at the wrong time of day. Maybe your followers don’t appreciate your status updates on the rule against perpetuities. Or maybe, just maybe, your content stinks. Now, don’t take that personally. First of all, we’re lawyers, all right, so we are equipped to persuade judges about personal jurisdiction, not write clever status updates from time to time. So it’s okay, but it’s important for us to understand how the type of content that we have affects us achieving our goals, meaning the better type of content that we have, the more likely it’s going to resonate with our target audience. It’s going to capture people’s attention and it’s going to help us to accomplish our marketing and business development goals. So the key is to figure out what type of content we should use to attract new clients. You see, all lawyers are different. Some of us are strong writers, some of us are networkers, some of us have innovative practice areas. Some people have written books, some people do speeches, some people are extroverts and like to be out in front of a camera, and some people prefer to be a little bit more behind the scenes and demonstrate our knowledge through blogs, articles, write papers, etc. Whatever you like, it doesn’t matter, but you do have to create a content strategy that fits your strengths so that you can create social media content that resonates with your target clients. And so we’re going to cover three types of content on today’s episode that I think should be considered as part of every law firm’s tool chest and that is photos, videos, and blogs. As you’ll learn today, a combination of these elements is really a great recipe for a social media strategy and we’re going to dive into how you can use each of these for your law firm and your social media strategy. Okay, so let’s start. Let’s start with photographs. What kind of photographs do we need? Well, I’ll tell you what type of photos are not compelling and that is ones that you take of your lunch before you sit down and eat it. And I know that you’re not going to put that as part of your social media strategy, but I remember back in 2011, I was working with an organization called Meritas and we had just authored our book called The Social Media Guide for Lawyers, and an audience member stands up and said just that: isn’t social media, just people taking pictures of their food? And that was really people’s thought process, particularly lawyers and their outlook on social media. And now Facebook of course, is the most widely visited website on the planet. Lawyers use it. Our clients use it. My mom uses it (too much), so it’s important to have quality photographs and it’s not that we need to post things every day, but we do need to have engaging photography regardless of our type of firm or the type of practice areas that we have. What I mean is Facebook, LinkedIn, Instagram, Twitter, Snapchat, they all have one thing in common and that is that people digest this content, this media on their computer or scrolling through their mobile phones. And if you have bland, blah content that doesn’t stand out, then your social media posts are just going to get lost in the shuffle because it won’t attract anyone’s attention. First, you will benefit from having professional photography. If you are a established law firm, maybe you’re a lawyer that’s been practicing for 25 years and you have a very sophisticated looking website, but your social media is just a bunch of selfies that doesn’t connect. You need to have photography that fits your brand and so it is worth the investment to have a professional photographer come out and take head shots of your attorneys, um, updated photos of your lawyers and your colleagues doing things around the office so that you have a fresh bucket of content that you can use and pull and also to take content when you’re hosting events, attending events, etc, so you can let people know what’s going on. So having professional photography is important, but there is one thing that you need to know and that is that your professional photography can and will go stale if you continuously use it over and over and over again. There is a law firm out there and I follow them on Instagram right now and I’m not going to call them out, but they have I think five or six photos that they recycle over and over and over and over and over and over and over again. And I’m like, okay, great: here’s the one of the attorney’s shaking hands. Then here’s the one of them standing at a desk pointing at a particular document and they change the caption up from time to time, but if I look at their overall Instagram profile, it’s really the same five or six photos. Just think about what type of an effect that’s gonna have on someone digesting your content. Think about sitting in the car and listening to the radio and if they played only the same five or six songs, what are you going to do? You’re going to tune out and put your attention somewhere else that keeps you engaged. And the same thing happens with photography and so if you haven’t had professional photography done for your firm, it’s time to do so and I do recommend refreshing that updated content about once a quarter and it’s not that expensive. You can hire a great local photographer for a few hundred bucks and they can come out and take a whole bunch of photos for you and use them for social. So one type of content you’re going to need is professional content and you do want to refresh that from time to time. The second is personal content and personal photos. I’m not talking about ones of you doing a keg stand at a Halloween party, but clients hire attorneys who they know like and trust and so it’s okay to pull back the curtain and show people what you’re all about. 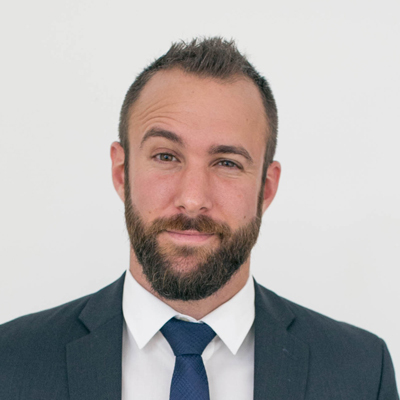 I founded the world’s first social media law firm and we do help clients with compliance, intellectual property, social media law, corporate law, but I’m also a certified crossfit coach, I travel often with my girlfriend and I like to go on adventures and go hiking, go to Iceland, and I definitely incorporate that as part of my firms overall social media strategy. Why? Because that’s just who I am and it’s authentic to people and it shows that not only am I a competent lawyer, hopefully, but also someone that people enjoy following and to stay engaged. So having those personal photos from time to time is really important part of the process and that’s going to give you a sufficient amount of content to work from and to engage people and capture their attention online. So we need a combination of both professional photography and personal photos to paint a complete picture of our firm and what we are all about. So what about video content? So video content in this day and age is key. I mean, let’s go back to the same example I talked about before. You’re scrolling through your feed, you see a text based posts, you probably scroll through and you see a photo, you may stop, but if you see a video content, you’re more likely to watch it. People just enjoy watching videos. It’s why we have Netflix, Hulu, screens of every shape and size that people want to see what’s going on with other people’s lives. And so video content as part of a law firm social media marketing strategy is really king these days because of how much engagement that it gets. I can lay out statistics that tell you how much more engagement video content gets than photos, but it doesn’t matter. The fact of the matter is that people enjoy watching videos and we should take advantage of that as part of our social media marketing strategy, or at minimum at least consider it. And see how it can work for us. So, what are some examples of video content that may be helpful? One thing that I like to do is to provide answers to frequently asked questions. So I might think of things like, for our purposes, you know, is Facebook a good marketing tool for lawyers? What type of photography should I be using on my social media profiles? How often should I be posting? What type of day should I be posting? Should I post the same content on LinkedIn or Facebook? These are different questions that we get from time to time. I know that it’s easy for me to answer and it would be helpful for my ideal law firm clients to be able to get answers to those questions and so that’s just a great place to start if you’re a beginner. If you were looking for some more advanced techniques, you might want to really demonstrate your personality and who you are because not only does video content allow you to educate your ideal audience, but also allows people to get to know you and your personality and what makes you unique, and different, and fun. And so we here at Social Media Law and Order recently filmed a whole bunch of videos getting to know all of our new team members and we had a ton of fun with it. And quite frankly some video content worked out really well, some video content worked out well, not so well. But it was still a lot of fun being able to experiment and do it. But what really makes video content cool is that not only do you get the chance to educate people and therefore build trust and allow people to get to know you, but you could do it in a way that doesn’t require you to sell yourself. In today’s day and age, people don’t like to be sold to. People like to be engaged with and so video content really does allow you to demonstrate your expertise, educate your target audience, but also letting people know a little bit about who you are, what you’re about, and so you create that connection with people to know, hey, this is the guy that I, or this is the woman that I, want to have to be my attorney. Well, video sounds really great, but that sounds like a whole production. Lights, camera, makeup. That sounds pretty expensive. Yeah. Well, I mean from my ugly mug, I need a lot of makeup in order to make myself look good on camera. But your videos can be expensive. I actually was uh, speaking with an attorney that was considering hiring us and they didn’t actually, but one of the key pieces they had was a $10,000 video that some other company made for him. And it was incredible. It was excellent. So you can go that route if you have the money to do so. But what I’m here to tell you is you don’t need to go to a production studio. You don’t need a fancy camera, you don’t need equipment, you just need an iPhone, an Android, and a few minutes of your day to get started. So let me give you an example. Today, I was shooting some videos at my apartment. We had a lot of people here at the office, at the studio and I want to just a quiet place to experiment and so I sat at my dining room table, I put my iPhone on a tripod and I opened up the sliding glass door, uh, or the, the, the shades of my sliding glass door and all this natural light come in and it looked fine and I was able to record some short videos and if I can do it, trust me, anyone can do it. Folks, you don’t know this, but Chido literally was showing me how to use the tripod yesterday. And I texted her at about 10:30 at night saying I can’t make the tripod tall enough. I eventually figured it out, but you don’t need to have fancy equipment if you have an iPhone, a Android, if you have a MacBook computer, if you have even a what are those cameras that people stick on Microsoft computers these days? Who uses that stuff? Like a definitely not a go pro. Webcam, Webcam. Oh my gosh. Webcam. Wow. Alright. If you have a Webcam, folks, it’s time to upgrade. Start using apple products. It is the 21st century. Whatever you have, trust me, it’s good enough. We have clients now that we’ve come up with together a really great content strategy to have people get to know who they are and one of the roadblocks that our clients hit is that they want the videos to be perfect and I suffer from that same hesitation from time to time. Chido and I were looking to film a whole bunch of video content a couple of weeks ago. I just got discouraged. The lighting wasn’t perfect. I didn’t sound great. Folks, it doesn’t matter. All of the excuses that you have at stopping you right now from hitting pause on this podcast… Don’t do it. Keep listening. And picking up your phone and starting to record some video content are just things you need to just get over the uncomfortableness and know that it’s not going to be perfect, but it’s going to be good enough and the more that you get started, you’re going to see that people watch your videos, they react to your videos, they comment, they offer encouragement. Sometimes they’ll troll on your content. That’s okay. Haters gonna hate, but um, once you get over that hump, you’re going to start creating magic, and you’re gonna start getting out there, and you’re going to start getting engagement for your firm and start getting people’s attention. And so whatever you have just start. If you want to go to a fancy studio, go ahead and do it, but you don’t need to do that to have a successful incorporation of video into your marketing strategy. Okay, so we have photos, we have videos that can be inexpensive, but you did mention blogs. How can blogs help us attract new clients? To me, blogs are the substance behind your social media. I thought mistakenly a couple of years ago that it was photos, videos and blogs were just there in the background. And now I think the complete opposite to me, blogs are the cornerstone of your content marketing strategy. Meaning that blogs give you the ability to really share your knowledge and experience with your ideal clients. You can identify problems, let people know that you understand the issues and offer proactive solutions that help to show people that you really know your stuff, and once you have these blogs, there’s so many wonderful ways that you can use them. They can be optimized landing pages for your website. That might sound weird. We’re going to cover this in the podcast, but they live on your website. They can be keyword optimized so that people who are searching in Google for your services may very well find your blogs because your website becomes so strong because of all this content, but zeroing in on social media purposes, photos are great videos or even better, but blogs give you the ability to take people from where they are, which is Facebook, LinkedIn, Twitter, etc. to where you want them to go, which is your law firm’s website. So consider this three step method. Let’s say, I don’t know, Chido throw an area of law that may put me on the spot. See what I can do. Oh my gosh, that one is really tough because usually you’re, your adverse clients are people who are burning down trees or are terrorists. But let’s go with this. So humanitarian law, let’s say that you practice humanitarian law and you, wow, this is really a tough one, and your practice revolves around lobbying the government for making big substantive changes in the law that’s going to benefit people large and small in a really meaningful way. And so your practice is all designed about getting in front of government officials and demonstrating to them that you are the subject matter expert on this humanitarian related area of law. So here’s how you can use blogs to demonstrate that. Let’s say that a key humanitarian issue happening right here in the United States is a big debate on immigration, and how we should treat migrants who are coming from South America into the United States. And you believe, and likely rightfully so, that everybody should be treated well. Whether you agree with the immigration policies, with you disagree, we want people to be treated okay and we want to make sure that as a humanitarian issue that everybody has sufficient food, water, shelter, and medical treatment. While the legislatures sort out whatever mess that they’re ultimately probably not going to sort out. And so you can demonstrate yourself as a subject matter expert by, for example, highlighting the five biggest problems that we are experiencing through the migration situation in the United States. The lack of housing and how this may violate particular types of federal laws. One, take an engaging photo of you, or perhaps an engaging photo of what’s happening right now in the migrant situation, and put that photo online or in your social media posts because it will capture people’s attention. Two, you then have a small caption or teaser that might say something like, there’s insufficient medical treatment in the United States and it’s not just hurting our migrants it’s also violating federal law, click here to learn more. And then step three is you post the link to your blog. By following that three step method, you’re going to capture people’s attention who are interested in this issue, they’re going to learn a little bit about what’s going on by seeing the teaser in your post, and they’re going to click back to your website where they can learn more. And by following this three step method, you took someone from Facebook, Instagram, Twitter, wherever they were, back to your website, and once they’re there, they now can learn more about your expertise. You can earn trust by going into more detail with that subject matter, you can, have a popup that invites people to subscribe to your humanitarian law related email updates so that you have a more exclusive communication method via email as opposed to competing for people’s attention through their news feeds. Once there, they can an easy to follow call to action to either pickup the phone and call you to discuss issues further or to submit a contact form to open up a discussion about how you can help with the humanitarian efforts and helping to change some of the government policy that surrounds this. And so having these blogs really becomes the cornerstone of your content marketing because not only does it help to capture people’s attention, it gets them back to your website. And that’s really critical, especially for digital marketing purposes. Because one, if you have google analytics set up on your website and have a Facebook pixel installed, and we’re going to cover all these throughout the podcast, you can then track everyone who goes to your website who clicks on that particular link and then re-target to them with perhaps more video content, more blogs or a call to action that invites people to contact you, and so it’s really powerful to be able to do that. So that’s just some of the fundamental basics of how a blog can ultimately help you and you toss me a really difficult hypothetical. Thanks for doing that live. We should’ve worked that one out before, but I hope this helps demonstrate the point of how when you have blogs it’s really the substance and then your photos and videos are designed to capture attention, and then the blogs will help you to get people to go back to your website. So it really is an important part of the process of social media marketing for attorneys. I mean that all sounds great, and there is a reason why you are an expert because you basically just wrote a blog and that’s really awesome, but not everybody is a born copywriter. Not everybody is able to kind of express and educate people through blogs. So how do you begin? Where do you start? That is a big problem, meaning that most attorneys who I talked to say, “Oh, I’ve been wanting to write a blog” or “I know it’s a good idea to write a blog, but it sounds like a lot of work and I’m busy with my cases.” So where do I recommend you start? There’s a few different recommendations I have for somebody in these situations. The first thing that I like to do is to say, let’s figure out what the subject matter of our blog is and how we can use this blog to be relevant and resonate with our target audience. So in our last episode on the Social Skills podcast, if you haven’t heard it, you can go back and check it out, but it helps you to identify who are your ideal clients, how can you help them, what makes you unique? And so positioning that part of your communication strategy to your blog. Let’s say that we have that humanitarian law blog that lives on your website and you use it to write about different humanitarian type issues and how it affects U.S law and policy. So, now we know the general subject matter and we know that our audience is going to be government officials, lobbyists, other people who are part of that process. So now that we know the subject matter of our blog, I would start with just brainstorming five topics. What are five things that I want to write about? What are five problems that we’re facing from a humanitarian perspective? What are five laws that apply to the, let’s say migrant situation for example, that people may not know about what are five, um, issues, legal issues that may arise based upon what’s currently happening in that particular situation. And so by taking those five different points, you now have five blog topics from within which to start writing content for. And now there’s so many different ways that you can do it from here. One, you can pick up your phone, you can hit the record button on your sound recorder and just talk about it. Talk about the first subject, talk about the second subject, talk about the third one and then pass it off to your assistant, to a transcription company, and you already have a rough draft that can be turned around to you that you can easily edit. It’s one way of doing it. Secondly, you can just start putting bullet points of what’s the three main points that you want to talk about for each blog, and then write a couple sentences about them and the next thing you know, you have a framework that you can then fill out or perhaps you can re-purpose other content that you’ve done. In this situation, let’s say that you wrote an amicus brief to the U.S. Supreme Court about a humanitarian issue that actually address these particular points. Now you can re-purpose them and use that into blog content as well. So no matter what your strength is, if you’re a strong writer, you can write. If you’re a strong speaker, you can dictate it, and if you already have experience in this area, you can re-purpose it. But that’s how I like to start. I’d like to start with “Who’s my target audience? What’s the problem that I’m trying to solve?” And then I like to write my content in batches. Meaning that if I have to set aside an hour a week to write blog content, I might push that hour aside based upon other priorities, but if I sat down and put 20 minutes, excuse me, put two hours on my calendar, one Sunday a month and wrote all five blogs for the entire month and then I’m done. That’s going to be a lot easier for me because I get it done. And then I can schedule one blog each week throughout the course of the month. So that’s how I like to get over the hump. We do talk about a lot of strategies about how to write blogs and how to use this five step process I talked about for creating blogs in our newest book, Social Skills, but just know that plan, prepare and executing a blog strategy is all part of what’s in the book. But those are really a summary of some of the major tips and strategies that we recommend that lawyers use to begin their blog writing. And to really get off the starting block and start getting their ideas down on paper. Wow. So we’ve covered a lot today, but as always you promised us a tip. So what is one way lawyers can start developing their own content plan today? Alright. So we talked about photos, we talked about videos, we talked about blogs. I think your very first step is to brainstorm what’s the type of content that you think you will need to create a successful content strategy that is relevant and resonates with your target audience and also what are your strengths and put that down on paper. So if you say, for example, that you are, that your ideal clients are small business owners and you are really strong in networking and going to local business and community events. You might start by saying I need photographs of me at these events because it shows me as a local leader. I need to take, let’s say photographs with other business leaders, or I might want to create video content that talks about some of the common issues that small businesses typically face in getting off the ground. And because you’re a strong speaker and because your businesses will resonate with the fact that you’re a leader in your community and that you can educate them, that might be what I would write down in my brainstorming session. Alternatively, let’s say that you are a humanitarian attorney and that you want to, you’re a strong writer then I would brainstorm and I would say I want to identify different types of topics. I want to start a blog, and I want to do four blogs a month, so just one a week. And so starting with this brainstorming process is really going to help to get the ideas from your head onto a sheet of paper. And then once they’re there, you can cross out the bad ideas, uh, reorganize and highlight the good ones and then put a plan in place. Once you have that plan, then I recommend you take a look at what content do you currently have? What photos do you currently have? What might I need to start a blog if I hadn’t started? From that point, you really do have a roadmap of what do I need to do to prepare the type of content that I think is best for my clients so I can start putting a social media strategy and plan in place. That’s really what all of us need to do regardless of our next step: we all need a plan that shows us how we can attract the type of clients that are right for our law firm and one that plays into our overall strengths. And to help you do that, we’ve come up with a five step guide to developing your law firm’s social media marketing plan, and you can use this free five step guide to figure out things like who are your ideal clients? How can you help them? And what makes you unique? But also a content strategy like we talked about today to help you jot down the types of photos, videos, blogs, or other types of content that you might find useful. So if you want to download this free guide to start developing a plan that’s tailored to your law firm and the types of clients that you want to attract, I invite you to visit DevelopYourPlan.com, and you can download our free five step guide to developing your social media marketing plan today. That’s it for today, guys. On our next episode of Social Skills, we will be discussing what social media profiles should lawyers use, but before you skip to the next episode, please take a moment to subscribe to our podcast. If you’d like what you’re hearing, please leave us a review and if there’s anything we can do to help you attract more clients for your law firm, send us a message.